Oxford Dictionaries defines a thermos as “A container that keeps a drink or other fluid hot or cold by means of a double wall enclosing a vacuum.” Pretty simple, right? 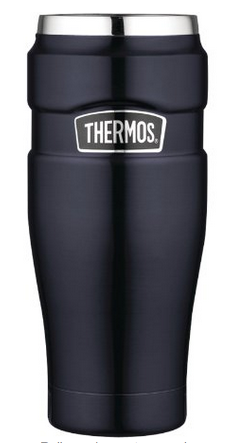 Urban Dictionary defines a thermos as “The most amazing invention of the 20th century.” Ok, sure! We like that one too. I think we can all agree that a thermos has a very simple task, which is to keep things hot or cold, and contained. Who knows better than the folks at Thermos, the company which has become synonymous with this word, in the same way that Kleenex is actually a company that makes tissues, but we still call all tissues Kleenex for some reason? There are many great things about this travel tumbler, so lets get into it. Quick science lesson here. When a hot fluid is contained within a vessel, one of the main ways heat is lost is through convection, where heat escapes through the wall of the vessel and you lose heat quickly. With this product, they’ve taken care of that with the dual steel walled airless space which they’ve created, which provides unmatched insulation and allows beverages or even soup piping hot for hours. It seems like magic, but its actually just science and the folks at Thermos have it down pat. Pro-Tip: Increase your thermal efficiency by pre-heating or pre-cooling your stainless steel tumbler prior to adding your favorite beverage. 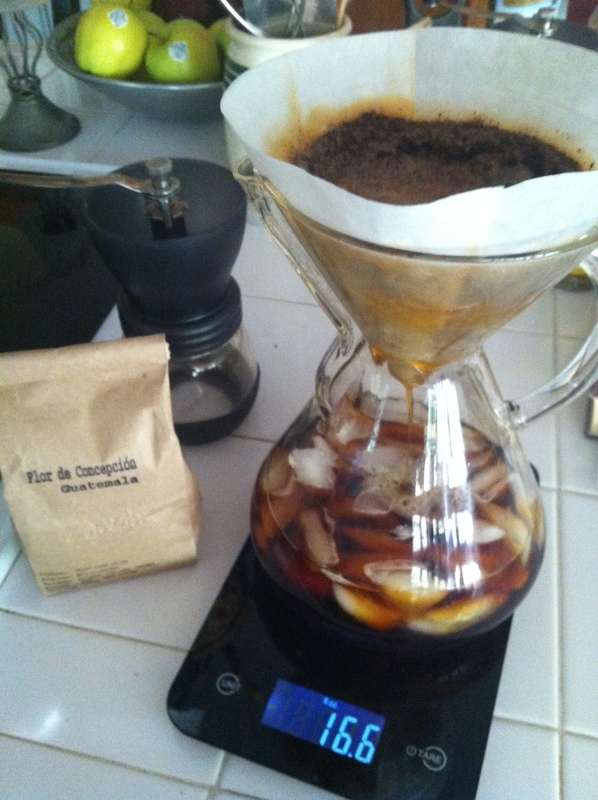 This will increase your tumbler’s efficiency overall and keep your beverage hot or cold even longer! 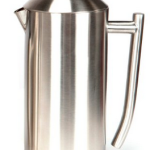 When it comes to a great travel tumbler / thermos for your hot or cold beverages, you just can’t beat steel. You just can’t! Function-wise steel is the best possible material for this particular job, because its durable (more like indestructible), clean, smooth, no weird tastes, won’t stain, aesthetically-pleasing, and just does it all as far as we’re concerned. Steel is also very easy to clean, in case you didn’t know. Soap and water – you can’t go wrong! Plus, have you ever heard of steel going out of style? Nope, it never has, and it probably never will. Ok look, we don’t hate coffee mugs. In fact, we rather like them. They can be funny, and carry tons of sentimental value. But here’s the thing – they drinks or soups they contain lose heat like its nobody’s business. 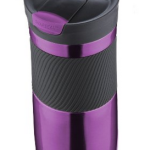 Also, its easier to spill your mug of coffee than it is to spill your Thermos travel tumbler of coffee due to its 100% leak-proof Drinklock sealing lid which operates simply by moving the lever on the top one way or the other. Not only does this Thermos travel tumbler keep the heat in, but it reduces spillage and saves you getting a new laptop in case you are the kind of person who has been known to do things like that. Not saying you are, just sayin’… Some people, right? 🙂 You can literally shake this thing around, turn it upside down, and stand there and yell at it and its not going to leak, so secure and insulated is this travel tumbler. Plus, as you may be aware, disposable coffee cups are destroying life on earth as we know it, creating islands of garbage in the ocean and we could stand to take a little bit of action when it comes to creating more demand for environmentally-horrible styrofoam baddies. Meaning, if you buy one of these, you instantly gain some good karma if you are a coffee drinker who likes to hit the drive thru all the time. Travel tumblers like this one from Thermos seems quite simple, and it is. It does what it does, and it does it better than the rest. Also, if you’re a get-up-and-go type of person, this travel tumbler is great. For all of the reasons we’ve mentioned already – keeps hot things hot and cold things cold, has a secure seal to prevent leakage, is stainless steel and highly durable – these are all reasons why you can throw this thing in a bag and go. Whether you’re just going across town or across the world, this thermos can be taken anyway. Its actually sort of has its own philosophy behind it, just by being so simple and versatile. …And we haven’t even really mentioned the one thing we love this travel tumbler for, which is coffee. 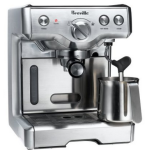 As you know, coffee can be made piping hot, or chilled, but either way, if you make yourself some quality home-brewed coffee, you’re not going to want to waste a drop of it. After all, didn’t you go to the trouble to make it? That’s why when you’re going to be taking your fresh-brewed coffee and pouring it into something, remember that its going to stay hotter and fresher longer if its in a travel tumbler vs. a regular old mug. One common complaint with this Thermos is that the paint starts to peel. Ah, not very a-peel-ing, right? LOL (not funny, we know). Anyway, once this travel tumbler begins to peel, it starts to look pretty shoddy, which is a real detractor from the look of your thermos, if not the functionality. Functionally, peeling paint does nothing to affect the solid construction and this vessel’s ability to do its job of keeping things hot or cold. One solution to the paint-peeling problem is to boil the sucker. 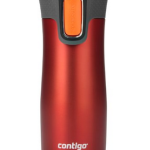 That’s right – you can’t harm steel but you can just boil the paint right off this thing and you will end up with possibly an even better looking thermos according to some people. Just have your steel wool scrubby at the ready and if your tumbler starts to peel, just take it off…take it all off!! Based on our experiences with this travel tumbler, we have nothing but praise for it. Its rare a product comes along that really has no issues (well, except the paint thing), but this is one of those products and it shows in the number of people who love it. If you’re someone who likes to get-up-and-go, and you like things that are served hot to stay hot, this thermos is for you! Oh, and it comes in a number of colors. Pick one up today – you can’t go wrong!